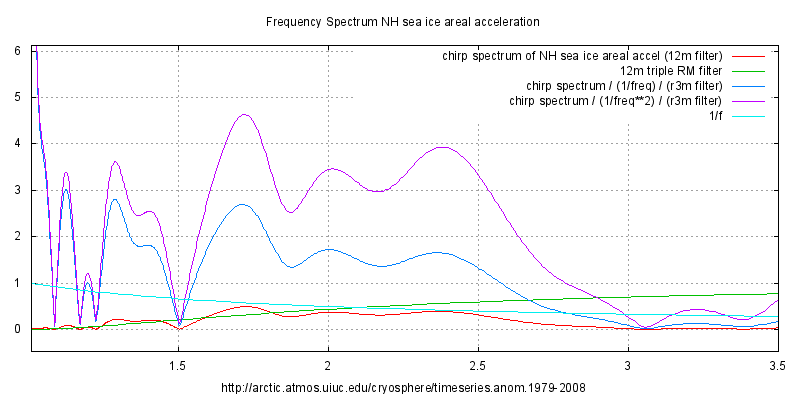 Chirp frequency spectrum derived from the second time derivative of Arctic sea-ice area. A reconstruction based on the triplet centred on a 2 year period accounts for much of the variation in this record. Including the large swing in 2007. The second derivative was used to make the time series ‘stationary’ since there is a downward acceleration over the 30 year period of the data. This is a prerequisite for Fourier type analysis techniques. A triple running mean filter was also used to remove the strong annual cycle in order to preserve the accuracy of the FFT calculations and avoid processing artefacts of this peak affecting the 1-2 year interval in the spectrum. Since the spectrum was derived from the second derivative, the centre of the peaks was determined from that output. However, to restore the amplitudes to that of the original area data, the 1/f attenuation of differentiation and the effect of the 365 day low-pass filter were compensated for, giving amplitudes close to that appropriate for the original ice area data. Two sets of frequency triplets are noted whose spectral separation suggests they are the result of an amplitude modulation. Thus the asymmetry in the side-bands arises from 1.2082-1.1997 = 0.0085 years (0.7%) in the central peak. This is within the expected accuracy of FFT and reading of the peaks. The central peak may be associated with the Chandler nutation variously estimated to be 433, 434.4, or 436 days. The physical cause of the Chandler nutation is still the cause of much debate and speculation. It manifests as very small amplitude variations in the direction of the rotational axis of the Earth and hence a deviation in the position of the geographic north pole. 17.6922 / 2 = 8.8461 years. The central frequency is likely to be bi-annual. A one year anti-correlation in Arctic ice has been noted in the literature, without a mechanism being provided. This may be an internal oscillation. The modulation period is close to the synodic alignment period of Jupiter and Neptune ( 12.78 years ). Since the planets are one of the factors affecting the eccentricity and precession of the lunar orbit, they will affect the lunar tidal force and may thus have an indirect affect on ice coverage. In a simple, ideal case the two side peaks would be of equal magnitude and here the 1.724 year peak is somewhat stronger than expected. There is a hint of a lesser, poorly resolved peak around 1.6 that may be adding to the amplitude, or some resonance could be amplifying it. This discrepancy does not seem to be large enough to discount the attribution of these three as being the result of amplitude modulation. print (sprintf ( " As A.M. sidebands: %.4f %.4f %.4f\n Modulation product: %.4f * %.4f "